August 12 1909 -- Here's one to keep the historians and sociologists writing theses. 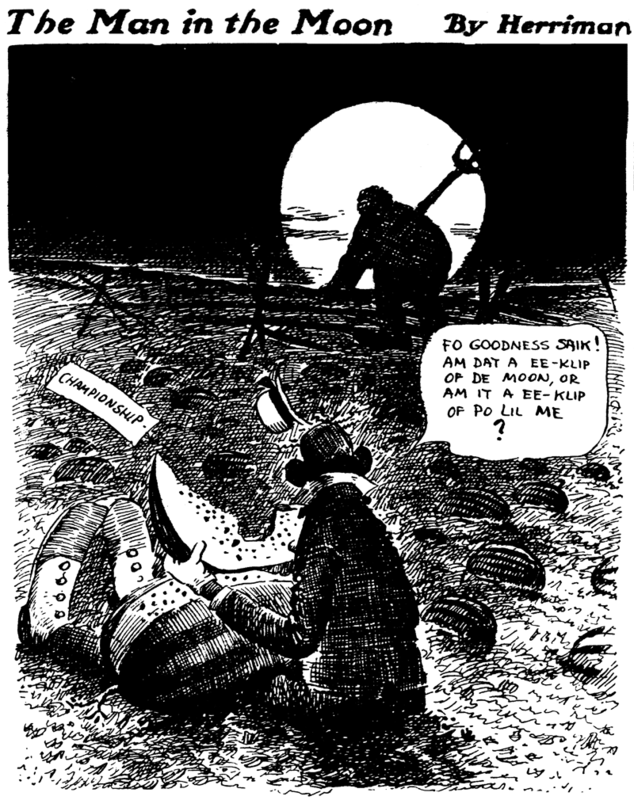 Herriman might be obliged by his editor to pen cartoons in favor of Jim Jeffries in the upcoming bout against Jack Johnson, but it seems very far-fetched to say that Herriman was required to depict Johnson as a mush-mouthed, ghost-fearing, watermelon stealing racist caricature. Cartoons like this make me wonder if the cartoonist's psychological profile includes a complete self-denial of his racial heritage (as opposed to merely passing for white, which is generally the assumption). Is it that, or is it self-loathing? What could make him draw this cartoon, a red flag betrayal of his family and his race?